Battle Angel Alita Deluxe Edition 5 Review – AiPT! The excellent Deluxe Editions from Kodansha Comics come to an end. The Battle Angel Alita Deluxe Editions have been some of the greatest manga reads I’ve ever encountered. Kodansha’s release of this classic series in the extra-sized format has allowed the art to pop even better than in the original version while allowing readers to catch up on a series that’s soon to be a major motion picture. Through the five standard volumes and the “Other Stories” collection I’ve gained a new perspective on this series and it’s sad to see it go with Volume 5, but is this last installment good? This FINAL VOLUME includes the rare, acclaimed story ASHEN VICTOR, plus two extensive interviews with creator Yukito Kishiro and all of the canon and non-canon endings of the original cyberpunk classic, Battle Angel Alita! This series is not only going to be a major motion picture, but it’s inspired quite a few science-fiction films from the last two decades as well. Originally released in the early ’90s, this manga inspired artists around the globe. That in itself should be enough reason to check this out. Check out my reviews of past installments here: Volume 1, Volume 2, Volume 3, Volume 4, and Holy Night & Other Stories. Alita vs. Zola. Who ya got? Running at 400 pages, this fifth volume delivers on four fronts due to there being three stories within plus two excellent interviews with the creator to wrap things up. 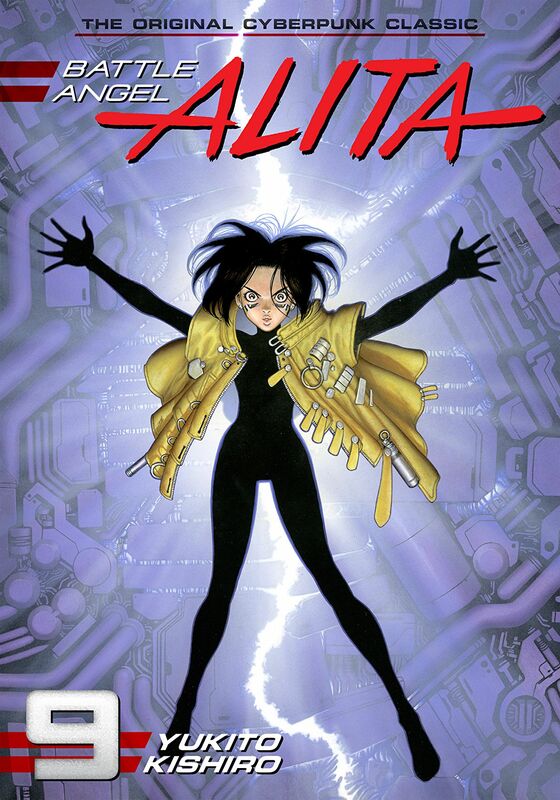 The stories include the finale to the Battle Angel series (which ended quickly due to creator Yukito Kishiro’s crippling stress at the time), a non-Alita canon story giving readers an inside look at Zalem and a different take on Alita, and a four-part Motor Ball story with art inspired by Frank Miller. It’s an interesting volume since it’s not the same focused story from beginning to end, but in a way that makes this read richer. By the end you get a better sense of Kishiro’s vision as well as more respect for what he accomplished in the science-fiction realm. The first half of this book is devoted to wrapping up the story as a whole (though fans will note that the story will reach its true finale in Battle Angel Alita: Last Order) and it does so in a satisfactory way. Alita takes on Nova and quite a few creative distractions Nova puts in her way. One of these screams as the inspiration to The Matrix, sticking Alita into a mental computer world with Kaos taking his powers from understanding machines by touch to a new level like Neo did and becoming one with the machines. This story wraps up Alita’s eventual revenge on Nova, gives readers an explanation for what is going on with Zalem, and gives Kaos a new direction so that the end is more of a beginning for a new journey entirely. Following this is an excellent Motor Ball section that is highlighted by exceptional art. Kishiro admits in the first interview within this book that the art in this story was inspired by Frank Miller’s Sin City and you can tell. It’s less detailed than Kishiro’s usual work and more striking in its form. It’s a fun story too, with more Motor Ball action. Finally, there is the different take on Alita that wraps this story up. It’s an interesting read, particularly because it makes Alita more of a weapon–it opens with her as some kind of Martian soldier attacking Earth–and because it reveals a lot more about Zalem. They may not be canon but these ideas about Zalem are quite intriguing, especially since they delve into the history of Earth and how the Scrapyard, Zalem, and everything else became the way it is. This collection also has two interviews with Kishiro, the first taking place in February 2018 and the second taking place in January 2017. These come highly recommended because they discuss not only the creation of this series, but also Kishiro’s reflections on the upcoming film. You gain a bit more insight into the man as well as his approach to this work. Never skimping on the ultra-violence. Seeing as this isn’t one long continuous narrative the overall read can feel all over the place. The non-canon Alita story is great, but since it’s not part of the main plot it can seem erroneous. The story is also very fast, glossing over aspects of the plot and seemingly cherry-picking ideas. There are plot holes that don’t add up, as if the story was written to be canon but then that element was later abandoned. The Motor Ball section is visually great, but it’s also quite drab and hard to get into. If you’re a super fan you’ll love it, but I had a hard time caring about this section of the story. What can I say beyond the fact that this is a series all manga fans should read. Beyond this, all science-fiction fans should read this too since it’s obviously inspired so many movies over the years. If you’re anticipating the upcoming film you can’t go wrong reading this and the entire series as they fill out the world and make the adventures of Alita all the more rewarding. What can I say beyond the fact that this is a series all manga readers should read. Beyond this, all science fiction fans should read this too since it’s obvious it inspired so many films over the years. If you’re anticipating the upcoming film you can’t go wrong reading this and the entire series as they fill out the world and make the adventures of Alita all the more rewarding.